Several people have commented that the www.ivona.com site has closed since the company became part of the Amazon group in late 2016. The two Ivona voices are available here - http://www.textaloud.com - if you want to listen to short phrases using either of the Ivona voices. Edit 2 (15 Apr 2017) - the Welsh voices had vanished for a short while from textaloud. If this happens again, try http://www.readspeaker.com instead - scroll down their home page to find the sample box and choose 'Welsh male/female' - they are the same as the ivona.com voices. Unfortunately, the 'Welsh, Gwyneth/Geraint' voices seem (as at end March 2017) to have vanished from the available samples on www.textaloud.com, although the related products are still for sale. The samples left are Welsh-English accents. You can put samples of text into the sample box here - http://www.ttsforaccessibility.com - but it will add a short phrase dyma enghraifft ('here's an example') at the beginning or end of what you type, and there is a low music track playing in the background. Edit (15 Ebrill 2017) - the Welsh voices are back on the textaloud page. 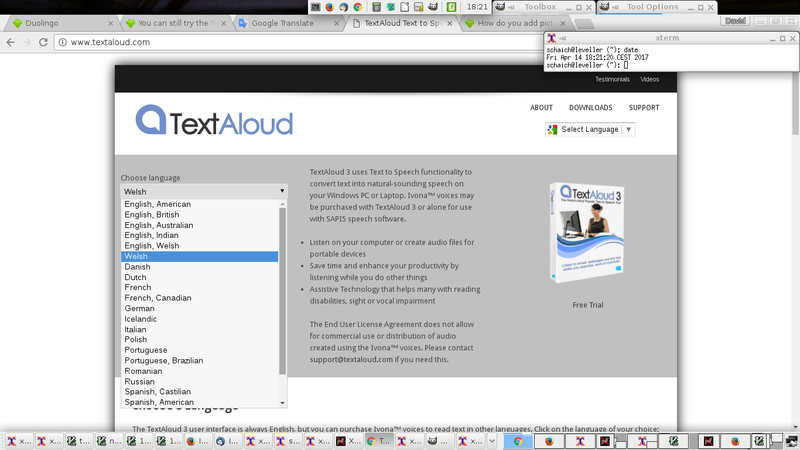 FYI, I'm still able to sample the 'Welsh, Geraint' voice at textaloud.com. Just checked again, and the Welsh voices seem to be for sale but not for sampling. The two 'English, Welsh' voices on the samples drop down menu are for Welsh-accented English, not Welsh. Have you a link to any Welsh samples there? Perhaps it's a geographic restriction, UK vs. Europe. I still have the Welsh voices in the drop-down menu on the main page, and had Geraint read me a sentence that was glitching on Duolingo half an hour ago. One thing that is strange is that 'Welsh' is out of alphabetical order in the drop-down menu, in between 'English, Welsh' and 'Danish'. (I always type to jump around those sorts of menus, so I hadn't noticed this oddity until now.) Here's a screenshot that I'm too cautious to post directly into this comment. Yes, it's working for me now, too! I'll try to check again tomorrow and then update the info here. Here is another site - scroll down their home page to find the sample box and choose Welsh Male/Female - http://www.readspeaker.com. The female voice is the same one as used on Duo. that is pretty smooth to listen to. Thanks.